This hat is a nice piece to wear for cool days. 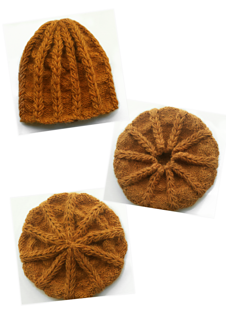 Fashioned in baby alpaca, and knit in the round with a purl and a knit stitch starting from base of ears/head circumference to crown. Detailed with a pattern of two loops to form the flowers.